Published and overseen by the International Organization for Standardization (ISO), the ISO 9000 standard is a collection of management principles designed to ensure that the Exterity quality management systems meet the needs of customers, staff and other key stakeholders. 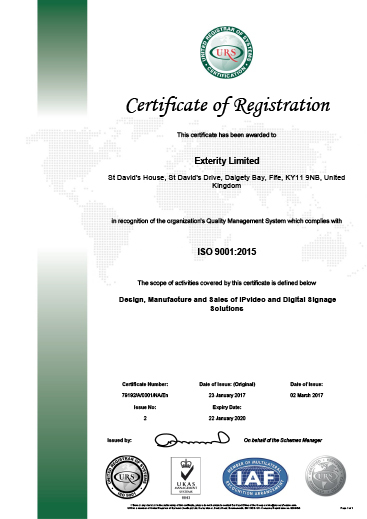 Within this structure, ISO 9001 concerns the requirements Exterity has to fulfil to successfully meet the standard. 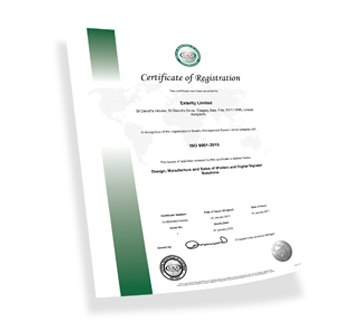 ISO 9001 is one of the most widely adopted management standards in the world, used globally in over one million organizations. 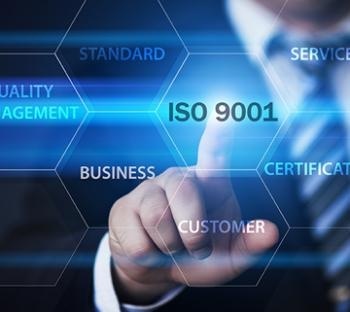 Because ISO 9001 has to be independently certified, it carries a great deal of weight both within an organization itself and outwardly to its customers and the marketplace at large. Having gained this certification is a reflection of the company’s commitment to quality assurance across our entire operations. Our products are built on industry standards, enabling us to partner with best-in-class technology vendors. Using sustainable, eco-friendly design principles, we also aim to minimize overall environmental impact, through lower power consumption, flame-retardant housing, more efficient packaging and better recyclability, all of which not only reduce environmental impact, but also lower operating costs.